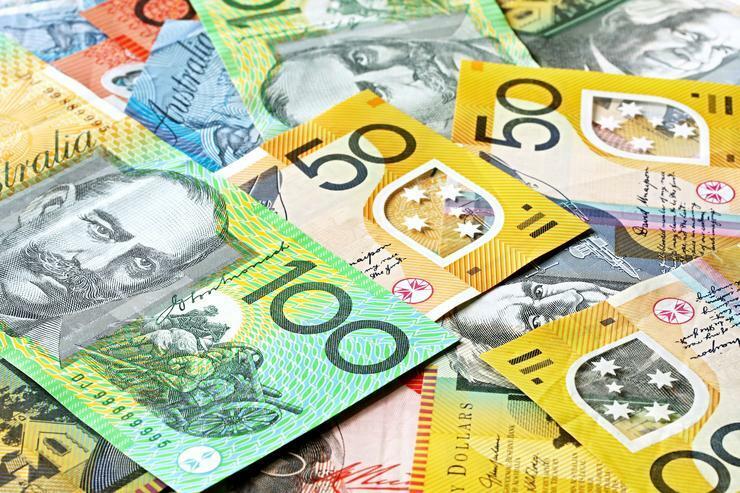 Security spending in Australia is expected to reach $3.9 billion in 2019, growing 9.8 per cent, according to data from research firm Gartner. 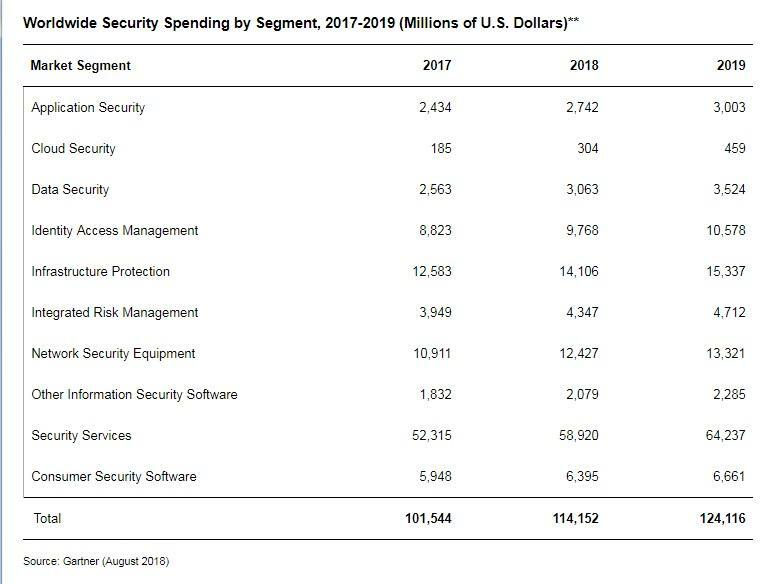 This year, security spending it set to reach $3.5 billion, which Gartner revised from $3.8 billion, after expanding its scope on what security information entails. New segments were added including integrated risk management software, tokenisation, threat intelligence, vulnerability assessment among others. 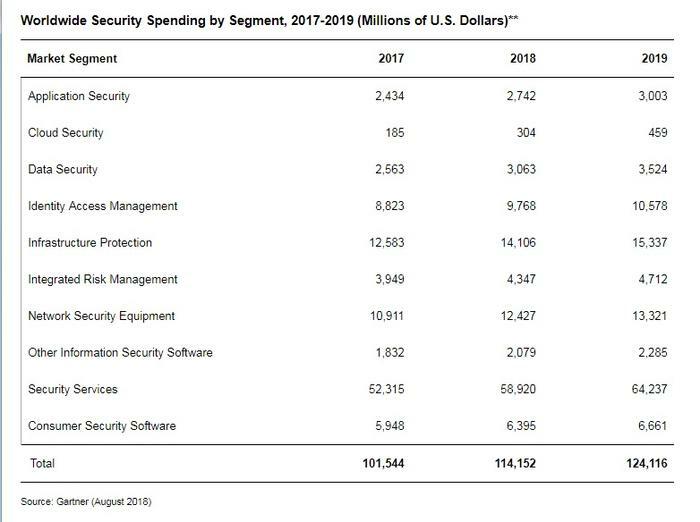 Security services, which include consulting, hardware support, implementation and IT outsourcing services, will represent the majority of spending, exceeding $2.15 billion in 2018. Meanwhile, worldwide spending on information security products and services is forecast to increase 12.4 per cent reaching more than US$114 billion in 2018, according to Gartner's latest forecast. In 2019, the market is forecast to grow 8.7 per cent to US$124 billion. More than US$58 billion is expected to be spent on security services worldwide - infrastructure protection is the second highest spending focus and should reach US$14.1 billion in 2018 followed by network security equipment with US$12.4 billion. "Security leaders are striving to help their organisations securely use technology platforms to become more competitive and drive growth for the business," Gartner research director Siddharth Deshpande said. "Persisting skills shortages and regulatory changes like the EU’s Global Data Protection Regulation (GDPR) are driving continued growth in the security services market." In September and October 2017, Gartner conducted a survey to gain insights about current and planned security spending - a total of 480 respondents participated in the survey, from eight countries: Australia, Canada, France, Germany, India, Singapore, the UK and the US. This survey found that the top three drivers for security spending are security risks; business needs; and industry changes. Privacy concerns are also becoming a key factor with Gartner saying privacy concerns will drive at least 10 per cent of market demand for security services through 2019 and will impact a variety of segments, such as identity and access management (IAM), identity governance and administration (IGA) and data loss prevention (DLP). Gartner identified some trends affecting information security spending in 2018-2019 such as risk management and privacy concerns within digital transformation initiatives, which is expected to drive additional security service spending through 2020 for more than 40 per cent of organisations. Subscription based and managed services are expected to represent at least 50 per cent of security software delivery by 2020. Security-as-a-service is on the way to surpassing on-premises deployments, and hybrid deployments are enticing buyers, according to Gartner. During another survey, Gartner found that s large portion of respondents plan to deploy specific security technologies, such as security information and event management (SIEM), in a hybrid deployment model in the next two years. Managed services represented roughly 24 per cent of deployments, on average. "On-premises deployments are still the most popular, but cloud-delivered security is becoming the preferred delivery model for a number of technologies," Deshpande added.